8 out of every 10 boxers don’t know how to come in with the jab. It’s a random statistic I just made up but my point is: hardly anybody moves their head when they come forward with the jab. Anytime you bring yourself closer to your opponent, you’re potentially walking into a dangerous counter punch. For this reason head movement is crucial for all forward movements—ESPECIALLY THE JAB. It’s time you learned how to SAFELY come in behind the jab. …and this is what happens when I jab straight forward without moving my head. I can understand beginners being taught to come in with their head straight up. It develops good form and posture and confidence and power and all those nice things. But once fighters learns that, it’s time to get slick real fast. Always be ready to slip when you come forward. This should be a general rule of boxing. Slipping is FAR MORE IMPORTANT when going forward than it is for going backward. If you’re coming closer to your opponent, you have to slip to stay safely in range. Coming in with a high guard works too but how can you attack on your way in if your hands are busy blocking? You don’t have to slip every time you go forward but you should always be ready to do it. The amazing thing is that many fighters are taught to slip when going backwards or at the end of combinations but very few if ever are taught to slip when coming forward with the jab. Most trainers let their fighters to come in with their head straight up. If you’ve ever sparred with a slick pro, then you already know that’s never a good idea. Think of your head as being able to move within the range of a three-dimensional sphere. Again, be creative and use the full three-dimensional range you can place your head. Try putting it low, and then bringing it up high. Or putting it to the left side and then bringing it to the right. Keep moving it to different spots to be more evasive! This tactic also works well going backwards—try it. You don’t necessarily have to bait or slip your opponent’s punch. It’s simply the idea of moving your head when you throw the jab. Again, it’s crucial especially when coming forward with the jab. Now let’s see this simple technique in action! *** Please watch the video, it’s a far better demonstration than the pictures alone. Stand tall and then drop down and jab him in the stomach. Even if he blocks you can still push him back off balance. Lower yourself to bait the punch downwards. Then stand up and counter-jab over the top. Rotate the body forward to bait the jab straight on. Slip to the outside while throwing a counter jab. If you have long enough arms, you can use this to setup with a left hook counter. This setup can also be used to go “NEAR to FAR”. Post your head to the right to bait a really long jab. Cut over to the inside and counter jab on the inside. It may seem like a scary angle because you’re moving towards your opponent’s right hand but actually it’s a very awkward position for him to reach you once you’re shifted to his right side. Pull away when he jabs. Then come back with your counter jab. You can also do the reverse of this by going “NEAR to FAR” (not pictured). Put your head in close and then counter-jab as you pull your head back out. Move your head to a different position when you jab. The examples are simply examples. In the images, I am showing extra-exaggerated movement for demonstrative purposes. In actuality, the movements should be very slight—you move just enough to avoid the punch. Don’t limit yourself to my examples. Be creative and come up with different positions and different angles of moving your head. Try using more diagonal angles (ex: move from low right to high left, or forward right to forward left to back right with multiple jabs). 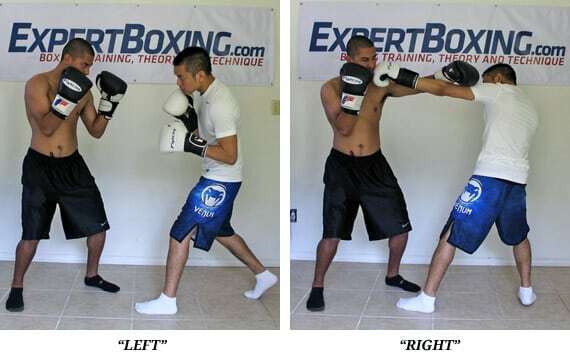 This is a great evasion drill and helps you develop the natural slipping AWARENESS for boxing. You will become a far more deadly fighter once this movement becomes so natural you no longer think about it! 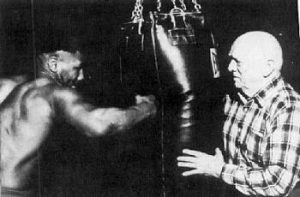 All this work is not merely to hit your opponent with a jab. It’s to set something up. Everything you just learned is supposed to be automatic. 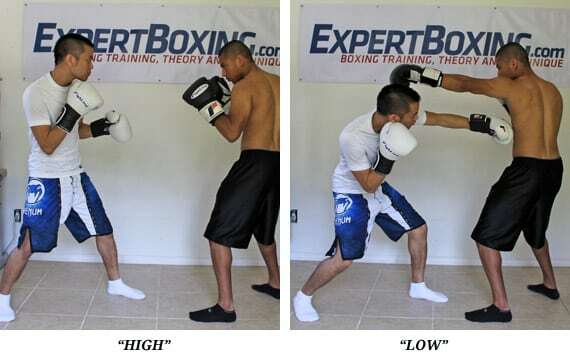 Using head movement to land the jab is the easy part; it should be trained into your subconscious. The real work you should be doing consciously is to land that right hand as fast as possible. So when you slip, make sure you keep that right hand ready to throw. Don’t over-twist your body or make yourself come off balance. Don’t take your right hand out of position just to land a jab! You should always feel like your jab is SETTING UP THE RIGHT HAND! Once you get used to the movement, you shouldn’t be too worried about slipping the punch or waiting all day to avoid a punch. Move your head and you’ll be ok. He will miss as long as you move from the position he aimed at. You only have to move a few inches which is easy to do even if you barely moved. As long as you’re aware of incoming fire, you can go back to focusing on being offensive! You can also think about angling your jabbing fist differently. The palm doesn’t always have to face the floor; the palm can face sideways (like a hook) or up (like an uppercut). BE CREATIVE! Try using the same head movement tricks BUT with a small dash towards your opponent. Get within just outside of his range, and then quick jump in 2 inches while you move your head and throw the jab. This is a very deadly maneuver that many experienced fighters do very well. It’s one of those things that separate the average amateur fighters from the better ones. Again, the key is to make a SMALL DASH. The best way to learn this type of head movement is to spar a pro. That’s how I learned it and it’s one of those things you never forget. You never realize how slick someone can be until you fight him. For those of you who don’t have the opportunity to spar a pro, I highly recommend for you to watch videos of James Toney or Bernard Hopkins fighting. It’s preferable for you to watch them sparring and to really look for that subtle head movement. Almost all pros do it but it’s so subtle you never see it unless you’re sparring them yourself. I can see it now only because I know what to look for. 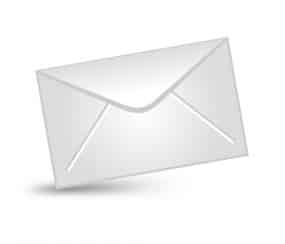 is to increase your defensive awareness. The slipping movement itself doesn’t really matter. The real lesson here is awareness! The real benefit to learning how to slip is not so that you can slip every punch but more so that you are fully aware of every punch. This increased level of awareness allows you to make whatever split-second reaction you like—slipping, rolling, countering, etc. You would think it’s common sense to be ready to slip but this isn’t the case for most boxers. Most boxers are so focused on throwing their power punches that they aren’t aware of jab counters. And they wonder why throwing the jab is so scary at times. They complain about getting countered or they complain that their jab doesn’t get there fast enough. Or they waste a lot of energy trying to jump into range. The real answer is simply awareness. Once you’re aware of incoming counters, you can pretty much walk into range and pop your opponent in the face with whatever you like. It’s really that easy. Everything you do will give advantages/disadvantages. The up jab from the waist is very useful in some situations but not all. I do agree that slipping jabs is not a good idea if you can’t slip the right hand that comes after. Better to get hit by the jab and save your slip for the right hand, than the other way around. do you have anything on the “feeling out process”? No I don’t right now but I will later. Riding the punches! It’s pretty much the same as shoulder roll or body slipping but if you’re late, it will be a trick to riding the punch. I can definitely do a video about riding right hands. It’s a fun trick the pros use a lot. oh riding the punch is a staple of mine. but im not as good at explaining it, i ended up confusing someone. the more i tried to explain it the more mixed up he got. i describe it is, turning the torso and shoulder with the chin tucked in away from the punch. to get the head turning away from the punch so it misses by about 3 inches from its peak point of power. but the timing and distance are hard for me to describe. and how would u teach some one to turn away from the punch which means not having a visual all the time on the opponent, but still knowing where the opponent is and not getting into a position to be hit by a follow up punch ? i put it down to getting low, tucking in the chin, keeping contact with their body to know if they are throwing something or moving. but i cant really explain it so im wondering if u would do it 🙂 besides if u did an article i might learn something i didnt know particularly riding with punches during exchanges..
will this head movement be beneficial for other punches such as the hook, cross, uppercut, etc? The same ideas can be applied but in the exact same ways. The details will have to be covered in another article. For now this article should give you a good start. Every move is potentially useful depending on how and when you use it. Some moves rely on power, others on accuracy, etc. 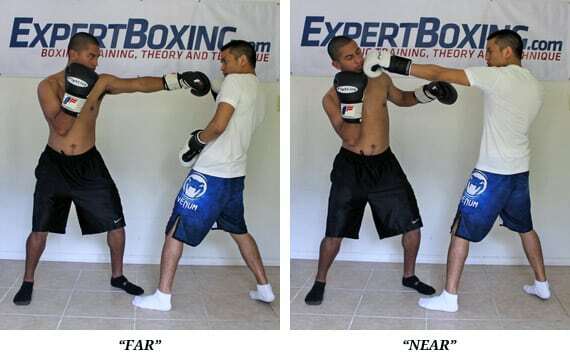 The leanback jab is a common punch. Maybe it doesn’t feel powerful or useful but I can assure you that it’s used on a regular basis. It’s fine if you don’t like throwing it, but you better get used to defending it because you will see a ton of those at the higher levels of boxing. I’ve never done that upwards parry jab because most fighters prefer to have their hand on top so that they can counter over. I’ve seen many up-jabs but never an upwards PARRY jab. i have seen several guys who purposely paw at the glove to distract the opponent from the right hand follow-up. andrewp, i think guys who sometimes fight with their guard lowered or all the time do the paryring upwards than those that have a high guard. the high guard makes it quicker easier and more accurate to downparry. i up parry with the elbow sometimes in close, but i do parry upwards with the glove very rarely. and only when my guard hand is down and instinct kicks it. i use a mix guard, but i think everyone finds the parry easier and more accurate in terms of timing and power when parrying down rather than up. i can use some shoulder to deflect a punch down but when up parrying its up to arm strength. 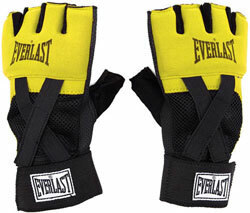 i have found up parrying with glove in a special case; against guys who throw hard stiff lefts or hard pushing right overhands rather than snap punches. i found sometimes parrying these stiff stiff jabs sidewards or down doesnt shove them away enough and they still land on the body. im talking about the impaling iron armed karate punches, theyre slow easy to see but because theyre so stiff, when parried they dont move too far off target. so yeah pushing upwards with the glove is sometimes the best weapon. i do upwards parries with the elbow when in close or near the ropes and this is much more useful than upward parrying with the glove. it can be done against hooks and straights. and keeps the arm in position to throw the counter hook and lead right perfectly with an overhand. 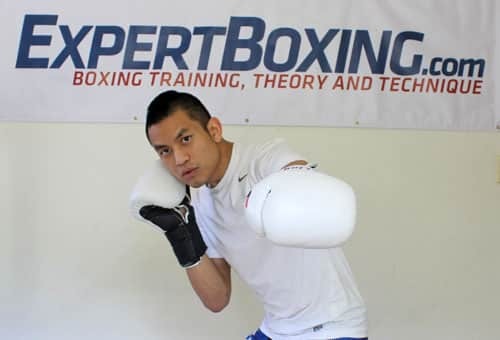 like johny i think generally everyone likes to throw the overhand counter to a jab because parrying down moves the left shoulder away from the chin exposing it to the counter more. in my opinion a proper down parry exposes the chin and sometiems sideparrying inside can make it harder on myself to hit the chin with the parrying hand. so i prefer side parrying outside, it creates a gap between shoulder and chin. downparrying also creates that distance. Firstly I’d jut like to say that I really appreciate the website, its been seriously helpful to me since I took up boxing almost 2 years ago. Because of this site I’ve been able to develop techniques way quicker than I could have otherwise. Reading this article I was just thinking about a situation at my current club. I keep getting put in the ring with an over aggressive boxer who is more experienced and about 10kg heavier than me who just pushes me around and beats me up whenever I spar him. My advantages are speed and footwork, but I fight him in a 12ft ring so this is very little help, even if I move around him and land a couple I just get pushed into another corner a few moments later. My coaches tell me to ‘keep pumping the jab’ but this just gets walked through and I always end up covered up in a corner. In this situation just a jab don’t seem to be enough. I’m pretty much prepared to go to any lengths to beat this guy because I don’t think he shows the right attitude. Can you advise me? You need to improve all your skills. If he’s bigger than you, you will have to be a far better boxer to beat him. Your scenario description is not really enough for me to give you tactical advice but I would start with developing a heavier jab and also learning how to lose fights. At some point, you have to be content with improving even if you can’t beat the bigger fighter. There are weight classes for a reason. Thanks johny;for another wonderfull article. Next week there is my national trial.it will be of very short dur. i.e. 1min or less.what strategy should I use. hi,I am a southpaw,can southpaws dance around the opponent? Yes they can and yes they do. This is my biggest problems, thank you so much for this! It’s been a while, still addicted to your site but haven’t had a moment to drop comments and well wishes, I hope everything is solid in your corner (I’m sure it is)! My body-style is more suitable for infighting, though I love to dance around and pick shots (it relates to your article of how we want to emulate what we usually are furthest from, not that I can’t but it’s not optimal for me), my bread and butter was fighting inside so my coach is sending me back to my roots. As my sparring partners got better, I was always getting caught coming in. I thought I had the fundamentals right, chin tucked, striding forwards, eyes looking through my brow but then crack! my head snaps before or during my right hand opening up. I’ve been working the head movement while jabbing on the bag, and am going to test it out in sparring tonight, I can’t wait. 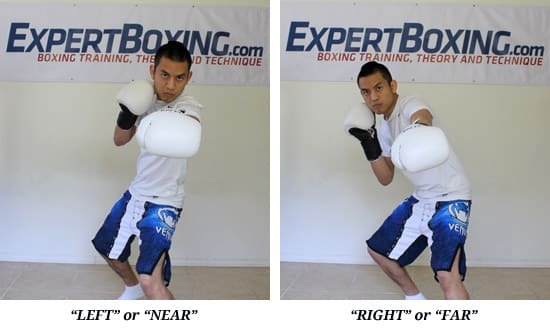 My issue is, as I come in (I’m being instructed to double jab in almost everytime), I’m pretty sure I need to change the angle of my head for both jabs i.e. near to far, low to high etc. Also, can you explain the “small dash” when you get a chance? I have a bad habit of hopping sometimes and I need to stamp it out. Ok,I hv been reading ur articles since I started boxing last year,and it help me a lot.I easily beat all my sparring partners cos I always dance around them so they tire out but there is only one guy who beats the hell out of me, he is a brawler,has great stamina and is a very hard puncher….,what should I do to keep him out of range?he’s my worst night mare! If you want to keep him out of range. You either have to outrun him or out-turn him. It’s also easier to do this if you’re countering him while you’re backing off. Throwing power punches while going backwards is hard to do if you’re still a beginner. who are the best boxers who do this? Larry Holmes, Ali? WOW! GREAT power and sharp hands. The first right was beautiful. I also noticed you mastered the art of slipping the right hand and countering with the left hook. Great stuff man. You have a very fan-friendly pro style. Then you need different type of skills. Having good footwork helps. Some opponents WILL run because they can’t slip the body shot. 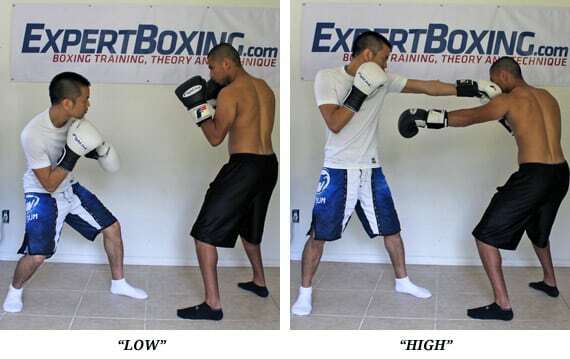 Many fleet-footed boxers will simply jump out of range. That’s what Machida does, too–he steps completely out of range. Had a question – what does it mean to ‘set up’ a punch? Is it referring to positioning your body, or getting your opponents hands up, or what? I’ve asked a few so called ‘experts’ and all they’ve managed to do is confuse the hell out of me. Setting up a punch means preparing the way for your punch to land, instead of throwing it without any prior preparation. Maybe it has to do with you moving to a specific angle, or maybe you do it by making your opponent move to an specific angle. Everyone has their own way of setting a punch. The reason why you’re confused is because you’re trying to find one right answer instead of looking for multiple answers. This is great stuff you have up. Much appreciation for your hard work and attention to detail. The jab with head movement makes me wonder about a few things. 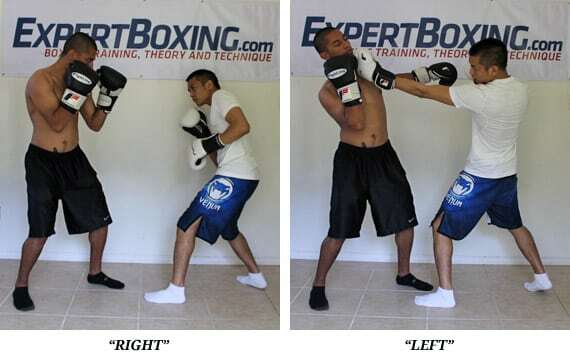 If you can close distance this way by using head movement while advancing with the jab, can you also advance with other techniques as well? For example, instead of using a jab, could you use a cross or perhaps a body shot? would these same principal’s aplly to a southpaw? 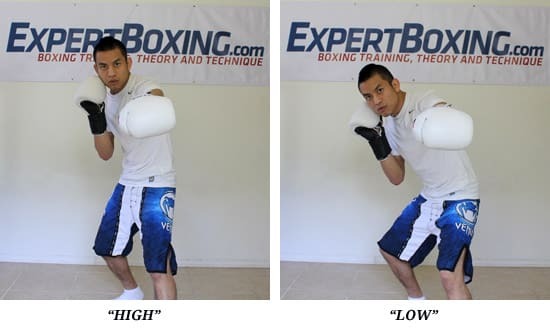 The principle of moving your head when you jab? Yes, it will help. I can’t see why it wouldn’t be helpful. Hey johnny Does jumping rope increase footwork? And how can i get my head movement better? Yes! Jumping rope can definitely help your footwork. (Especially if you’re not already doing it.) As for head movement…work the technique, and then do the drills. Practice it in shadow boxing, mitt work, and ultimately sparring. PRACTICE! i always move when i jab i keep trying new things but always seem to get countered, i try moving side to side back i try pivot and i try bringing my jab hand back to the head but sometimes my opponents wait for me to come in, is this because im too predictable or do i need to inch closer? another issue i have is my range i can find my range but i have a bad habit of not staying in range and getting closer, any suggestions on how to correct my errors Johnny? My guess is your jab is too easy to read. And a big reason for this is probably because you’re not as relaxed. If you’re not relaxed, the tension gives you away when you’re about to do something. Now I’m not saying it’s easy to be relaxed. This is hard to do when you don’t trust that something is going to work or when you’re not sure what you’re doing. It’s even harder to relax when you’re worried about counters. But that right there is what you have to work on. Throw a more relaxed jab…not lighter or weaker…simply more relaxed. Work on that. really nice guide johnny. Being a kickboxer i need to be careful with my headmovement because of getting kicked, but i found a great way to make it work. The Out->in jab work in kickboxing really well at any range, which makes it one of my favorite. The the ducking jab works well but only in really close range so i dont get kicked, but then on the outside i do a jab while trapping their lead hand. Great guide man, i can tell its a good site because i always see things on here that im taught or that i use, and its great to get reassurance on what works. For me I noticed doing the right evasion came naturally when I respected a guys power. But when I didn’t some of the most painful punches I got were from trying to jab taller opponents who were not as powerful. Sometimes running into a job hurts the worse because its combined with your own momentum. My biggest struggle when slipping right when jabbing is I could not follow up with anything else. Do you think this is because I just went too far and a more subtle slip wouldn’t have that problem? Or are there punches you can throw from the angles in your pictures? Your feelings are accurate, Tom. It’s hard to counter when you’re slipping right because your body is most likely facing to the right and you’re kind of folded up. And so it takes a lot of time and energy to pivot your body until’s facing your opponent again in order to land a punch. And it’s also much harder if you’re facing are facing right as well…which means you can’t face your body forward until your feet are facing forward again. The cure for this is to use a more subtle slip. AND/OR to have your head a bit forward and maybe even a tiny bit to the left in the first place so that when you slip to your right, you don’t have to fold or turn your body out of range. This article seems to be the mix the techniques of “3 axes of boxing” and your articles about jabs. The “near” seems like the “forward lean axis” and “far” seems like the “back lean axis”. Of course not that forward or back, more like right and left but they seemed a little similar to me. In your opinion, does this idea helps for training, improving? Or am I thinking too much? Yes, some concepts may share similar theories or underlying principles. Although, I don’t want to tell you NOT to think, I can however tell you that it’s possible to over-analyze things and end up missing the bigger picture. Johnny N is the bomb! You answer everything to help anyone anywhere anytime! Stumbled across this site by accident here in NZ, and have been hooked ever since with your easy to follow advice. Full credits to you good sir!